We are excited to share updates since you last heard from us in the fall. Since the study began in 2014, we have completed two annual surveys and are in the midst of Year 3 follow-up. We are very grateful for the time and energy you have given to the Generations study. Your participation in this research provides valid and reliable data that are necessary to shed light on what is and what is not working for LGBT people. Please take the time to complete the survey when you receive it. As always, if you have a problem accessing the survey, or if you have not received it, please let us know at generations@ucla.edu. May 2019 bring you peace and joy! - Ilan H. Meyer, Ph.D. This newsletter features updates on what we’ve done so far and gives you a look at the exciting things we are working on as we move forward. We have completed the first follow-up surveys and are in the midst of the Follow-up 2 survey. We cannot emphasize enough how important your involvement is in raising awareness of the needs and experiences of LGBT populations. This research is the driving force behind positive policy changes in support of our community. Your continued involvement represents the voice of the LGBT community, so please take the time to complete the survey when you receive it. If you have a problem accessing the survey, or if you have not received it, please let us know at generations@ucla.edu. Thank you for your ongoing participation, dedication, and interest in the study. We have completed the second year of data collection, and have already received the second round of follow-up surveys from many of you! 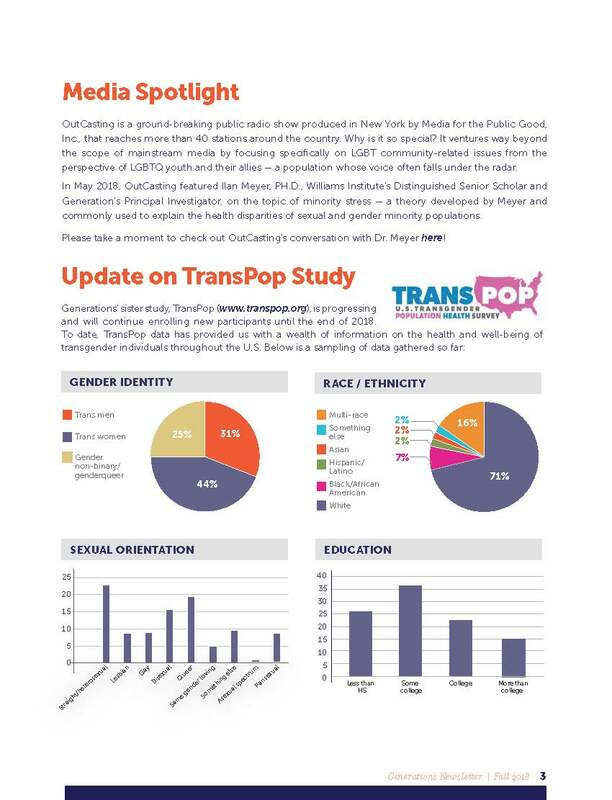 This study is unique because, together with our sister TransPop study, it is designed to represent the LGBT community in the United States. Please take the time to complete your follow-up survey once you receive it. It should arrive about a year after you completed the first survey. Let us know if you have a problem accessing it or if you haven’t received it at generations@ucla.edu. The newsletter below provides updates and let's you know what is coming up! Thank you for your ongoing participation, dedication, and interest in the study. We have completed the first year of data collection, and have already received follow-up surveys from many of you! This study is unique because, together with our sister TransPop study, it is designed to represent the LGBT community in the United States. We want to thank you again for your participation, dedication, and interest in this unique and groundbreaking study. 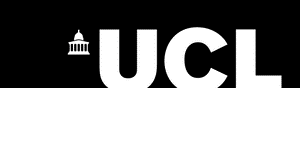 When you participated in the 2015-2016 interview, you indicated that you would be interested in learning about developments with this study, and opportunities to participate in other studies in the future. We have exciting news and updates to share about the progress we’ve made. This newsletter will update you on what we’ve done so far, let you know what’s coming up, and share some interesting findings we’ve made using the data you generously provided. 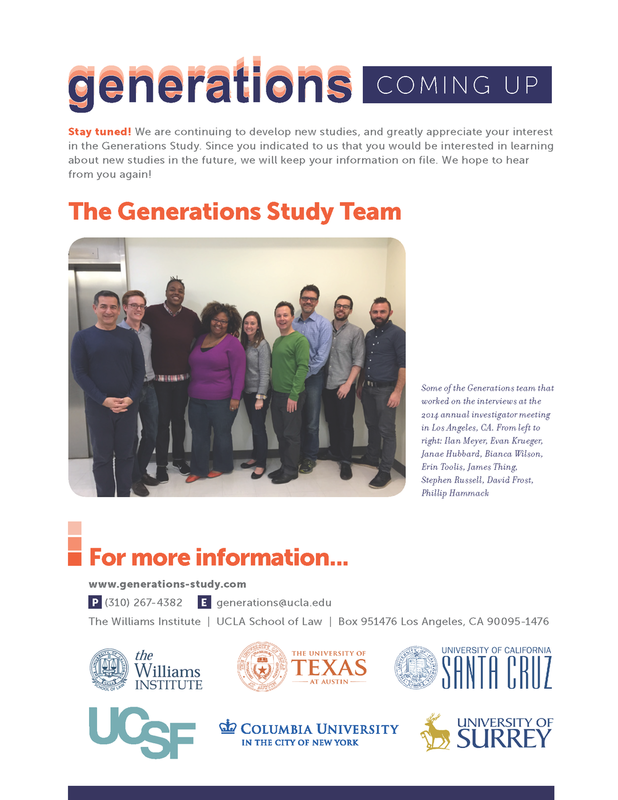 Please contact us with your ideas, feedback, or any questions at generations@ucla.edu. We look forward to staying in touch.